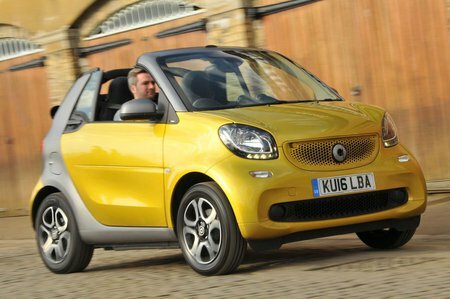 Smart ForTwo Cabrio Interior, Sat Nav, Dashboard | What Car? The Cabrio’s interior is quirky and entertaining. The fascia is dominated by a 7.0in touchscreen surrounded with black gloss, while the circle air vents look good, as does the instrument binnacle, while the fabric topped dash is a nice touch. Our car featured an individually mounted circular pod, which houses the rev counter and a clock, but while the Cabrio's plastics are textured, they are still hard and feel cheap. Visibility to the front and side is excellent, but the Cabrio’s thick rear pillars significantly restrict the view over the shoulder. Furthermore, the view through the low-set and narrow rear window is fairly limited, and even with the top fully down the folded roof blocks some of the view.